Big Game Vendor presents BGVToys Exclusive Funko POP! Television Dr. Who Eleventh Doctor in Spacesuit Vinyl Figure! The Eleventh Doctor wears the orange spacesuit when he travels to the newly-formed Earth. He looks great in my collection standing next to 10 & 12 in there space suits. Definitely worth getting. BGVToys still have some of these in stock. You do have to order them w/ a protective cover so they are $29. Where can i order 11th doctor spacesuit? BGV sold out. I don’t understand how they say it’s a limited run of 3000 or so!!! It seems like there are many more than that. They sold out in the states at the store where they were an exclusive. I just talked to them and they said they will be getting more in. They already sold over 1000 of them, and now the UK and Australia has a bunch to sell and there will be a lot at different conventions where Matt Smith is appearing. It just seems like they always say it’s a limited run of certain amounts but they always seem to make much more. I don’t get it. Oh well. Because they lie. Why say it is a Limited Run of 3,000 when we already know for a fact that it isn’t. BGV sent out an update to the Pop Price Guide Website stating it had 1,000 for sale & had sold on 2,000 to other vendors (Some of that stock was to be available at Conventions that Matt Smith was attending) but they themselves had already sold 1,210 in one day on ebay. If they sold 500 each to Popcultcha & Forbidden Planet that would be another 1,000 & then say 200 to 5 other smaller Vendors at Conventions make’s up another 1,000. So that’s 210 over the original 3,000 but more will be in stock? I think the continual use of words like RARE, LIMITED, SPECIAL EDITION & so on should be taken with a large dose of salt. Doctor Who Pop! Vinyl Figures – Eleventh Doctor Space Suit from Forbidden Planet UK, does the pop has any sticker? where can i order Doctor Who Pop! 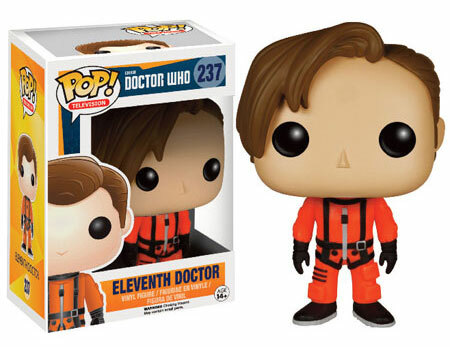 Vinyl Figures – Eleventh Doctor Space Suit? Wow. Sold out completely in less than 1 day. That’s great. I hope everyone was able to purchase one! Who knows where they will “pop” up elsewhere so anyone that missed these will be able to buy one? Hate to say it but the UK market seems rather lacklustre towards the Doctor Who brand at the moment with very little enthusiasm. I think they will “pop” back up on ebay at 3 times the price. Looking through the purchases made from the BGV ebay store plenty of scalpers were purchasing 6 at a time several times over! Yes, it seem’s to be as Limited to as many as they can sell once again! Proves the point. Two sellers on ebay already selling them at £42.56p under New Listings! I have been watching their website all week. At 10 AM ET they didn’t have them available (at least I didn’t see them). At 5:45 PM ET they were sold out on their website. I managed to snag one off eBay (they are sold out now). I too would have been very upset if I missed this. It’s better to be safe than sorry, I always think. So I would buy this now why you can,… Cause who knows if you’ll be able to buy it in the future! Yeah, look’s like they will sell-out in the next hour or two. How long d’you think these’ll remain on eBay? Not long. They only have a 1,000 & they have already sold 831 last time I looked. Really don’t want to miss this pop as I have them all so far. Do you think it’s worth waiting for uk release or get it while I still can from the US? Trouble is we don’t know who is telling the truth or lying anymore? There were only ‘supposedly’ a Limited number of the 10th. Doctor in Spacesuit available & price’s soared considerably when that came out. But FP seem to continually be getting stock of that figure in & out all the time, so just how Limited was it? This figure is again ‘supposedly’ a Limited run of 3,000. 1,000 have gone to BGV & 2,000 have been sold to other Vendors of which 500 will be at show’s that Matt Smith will be attending. Myself I’m buying off their ebay store so I can get it. I’m not leaving it to chance like I did with the 10th. & missing out this time. Does anyone know if this is from the 1st. Series or the current 2nd. Series of Funkos now being released? The number put’s it back quite a way? So, so much for the Limited Edition. The lie has already been proven. BGV were only ‘supposedly’ going to have 1,000 in stock. Strange then that they have already sold 1,035 on ebay? Booboo, do u know if itll be at Portland Wizard-Con? BGV according to their website aren’t doing Portland Wizard Con but you can buy it direct from them in the US in March. Anyone else will have to buy it direct from their ebay store at $19.99, but for place’s like the UK it cost’s just over that in postage at $22.99 as well. So double the price straight off & you will probably get hit for Customs/PO Fees as well unfortunately. On Pop Price Guide it said this pop would be at conventions where Matt Smith would be and Matt Smith is going to be a Portland Wizard-Con. It also said this pop is being sold by other distributors. What im wondering is will it be at Portland Wizard-Con. Reading the article link you posted does not bode well for this figure. The hair looks way better on the cartoon picture than on the actual figures. Puts me off the figures of him. Nice little rip-off here at $50 a pop! Plus postage, customs & PO fee will add up to a tidy sum? Hopefully we will get it in the UK? Oooh, will have to pick this up to go with my 10th and 12th Doctor space suit versions. Strange? I wonder where this fit’s in the scheme of things? The numbering of (# 237) take’s it to around the (# 239) 12th. Doctor Spacesuit variant from Series 1. I wonder if it will be part of Series 1 like the ( # 227) Materialising Tardis was that was just released? This doesn’t look right. The pop has patches on his spacesuit. On the box it doesn’t show patches and in “hide” he didn’t have patches eather. Kinda weird. I can’t believe Funko would make a mistake like this.